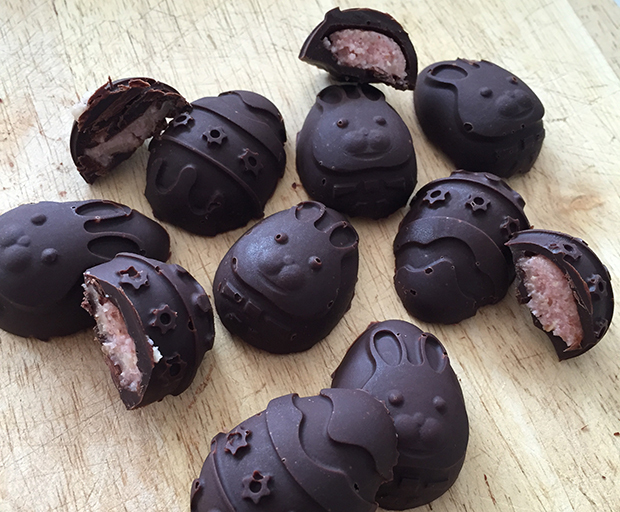 It doesn’t take much persuading to add a bar of chocolate into a shopping cart at the supermarket, but have you ever contemplated making your own chocolate at home? 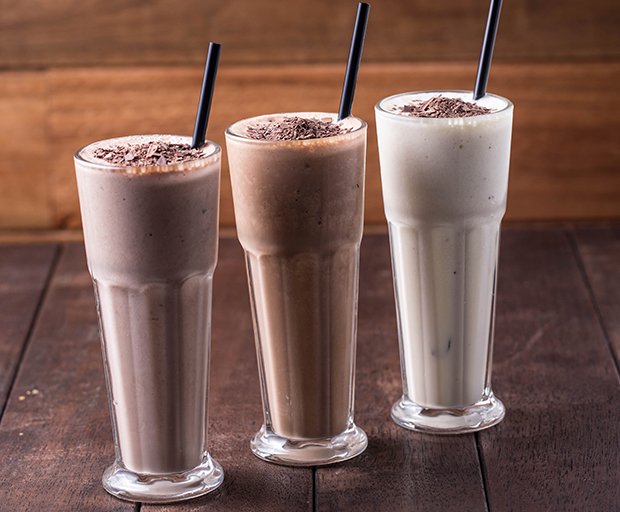 Sure it might take a little longer, but you can customise the recipe to suit your dietary needs, especially if lactose-free food is at the very top of your priorities. 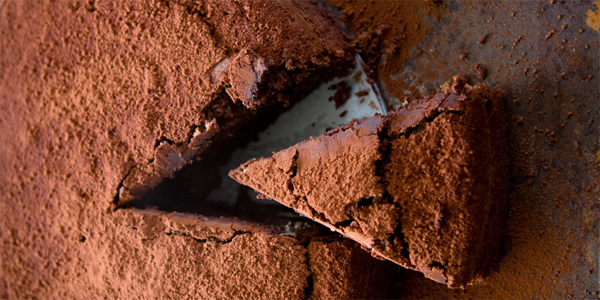 Test your MasterChef skills with this straight-forward recipe to achieve yummy homemade chocolate. Get started by chopping the cacao butter until the pieces are 1-2cm large. Then transfer to a large bowl and beat with an electric mixer on high for 40 seconds. Make sure to mix the cacao butter until it has melted into a soft texture. Take your time with this step so that the batter is consistent. Add the cacao butter, raw honey, vanilla bean extract and sea salt into the bowl and mix on low speed for 10 minutes. By now the mixture should be creamy enough to pour into a lined dish or rectangular tray. Wait for the chocolate to cool, then it’s ready to eat! Feel free to add fruits and nuts such as cashews and almonds to create a yummy and healthy treat. A childhood classic, these choc-chip cookies are the perfect balance of chew and crunch, with a nutty sweetness that will attract more hands to the cookie jar. Preheat a fan forced oven to 180Åã C and line a baking tray with baking paper. In a large bowl combine the wet ingredients. In a second bowl combine all of the dry ingredients except for the chocolate, almond flakes and popcorn. 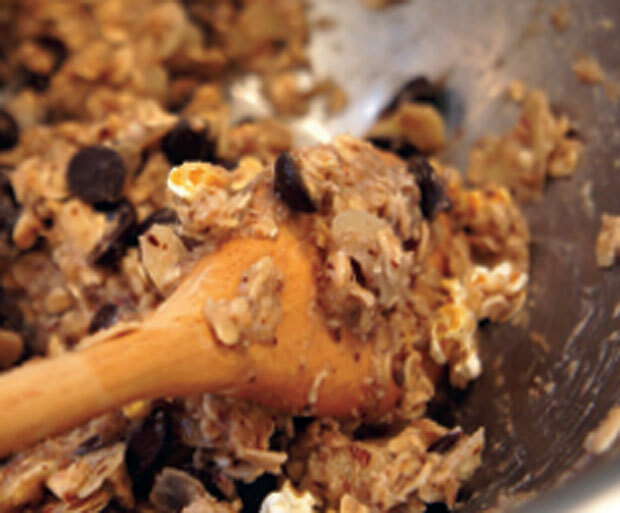 Transfer the dry ingredients and combine with the wet ingredients, ensuring you combine well with a wooden spoon. 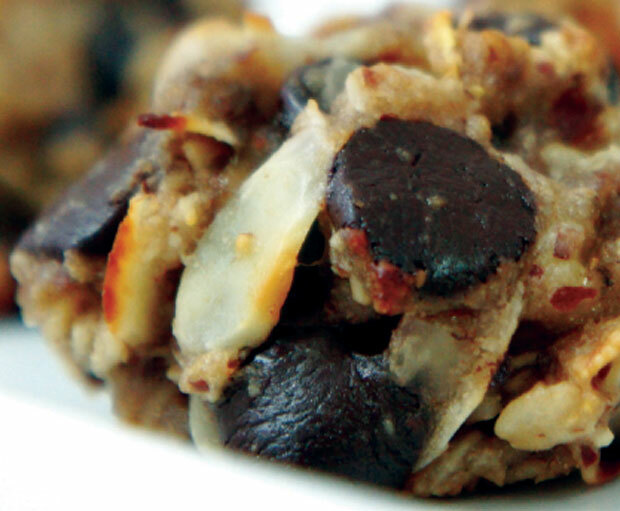 Toss in the chocolate pieces and almond flakes and stir well to combine. Roll about a tablespoon of the mixture in your hands to create a small ball, place onto the lined baking tray and continue until you have rolled all of the mixture. Allow enough space between the balls for expansion when baked. Transfer to the preheated oven and cook for 14 minutes. The cookies will be a light brown colour on top and a darker colour on the bottom. Jamie Oliver’s wickedly gooey puds will score you top marks for an indulgent end to your romantic meal. Make them in advance and keep in the fridge until you’re ready to cook them so you can kick back, relax and concentrate on working your magic. 1. Grease 2 small individual pudding moulds. Melt the butter over a low heat, then stir in the chocolate. Meanwhile, beat the eggs with the sugar until pale and thick. Lightly mix this into the chocolate, then fold in the flour. Divide between the moulds and refrigerate for at least 30 minutes. 2. Preheat your oven to 180°C/350°F/gas 4. Place the moulds on a baking tray and bake for exactly 14 minutes. Remove from the oven and leave to cool for a few minutes, loosen with a knife, then place a small plate on top of each mould and tip upside down. Leave for a minute, then remove the moulds. Serve with berries and crème fraiche on the side. 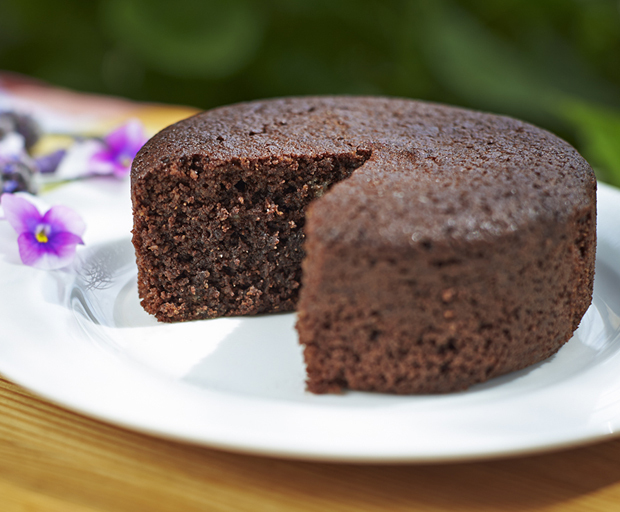 TV chef Dominique Rizzo shares the perfect Valentine’s Day dessert: a decadent flourless chocolate pudding recipe that will win the heart – and tastebuds of your honey! 1. For the basil and strawberry salad, combine Gourmet Garden Basil, strawberries, icing sugar and orange juice in a bowl. Toss together and sit in the fridge until ready for use. 3. Grease and flour 10 ramekins with butter and cocoa, or if using a spring-form tin, line with alfoil and baking paper. 4. Place the water and sugar into a saucepan and bring to the boil, stirring to dissolve the sugar. Take off the heat and add in the butter and the chopped chocolate and stir gently to melt the chocolate. Add in the eggs one by one whisking as you add each egg until the mixture is thick and glossy. Once the eggs have been whisked in pour the chocolate batter into the tin or ramekins (2/3 full) and place in a water bath and cook for 25-30 minutes until slightly wobbly in the centre. 5. Once cooked, remove the tin or ramekins from the water bath and allow to cool just enough to invert the puddings from the moulds, a few minutes. Serve with double cream and the basil and strawberry salad. What are you cooking for Valentine’s Day? We’ve tried a lot of chocolate chip cookie recipes, and believe us, this really is the ultimate recipe. The cookies have that perfect chewy texture and smell divine. Adding chopped nuts is optional, but serving with a glass of milk is a must! 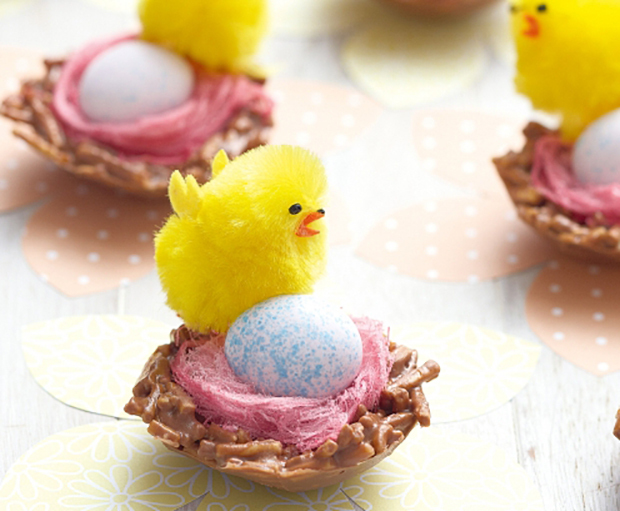 A great baking recipe for the kids too. 1. Preheat oven to 190C. Line a baking tray with baking paper. 2. Mix the sugars, butter, vanilla extract and egg in a large bowl. 3. Sift the flour, baking soda and salt together. Stir it into the sugar mixture, followed by the chocolate chips and nuts if using. Do not over mix. 4. Scoop rounded tablespoonfuls of dough and place them 5cm apart on the baking tray. You can also use an ice cream scoop (flatten the top before baking for flat, round cookies). 5. Bake for 8-10 minutes, or until lightly brown. The cookies will still be a little soft, which makes them chewy when cool. Allow to cool slightly then cool on a wire rack. Note: if you like crispy chocolate chip cookies cookies, leave them in the oven for 10-12 minutes, keeping an eye on them so they don’t get too dark. 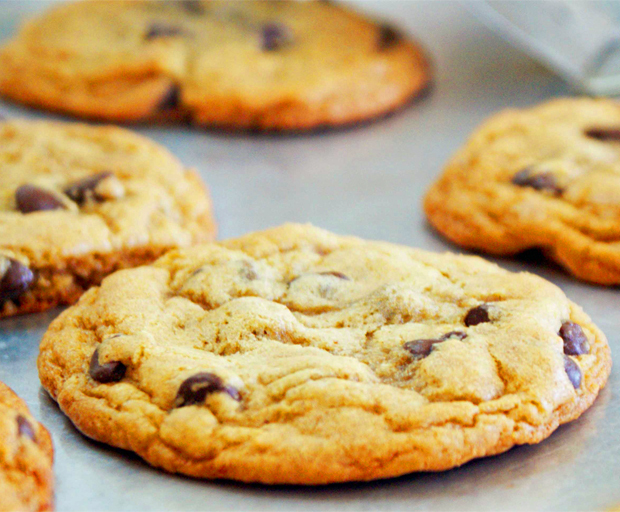 What’s your favourite chocolate chip cookie recipe? Sometimes, only a hot saucy chocolate pudding will do, served with a shock of cold vanilla ice cream of course! 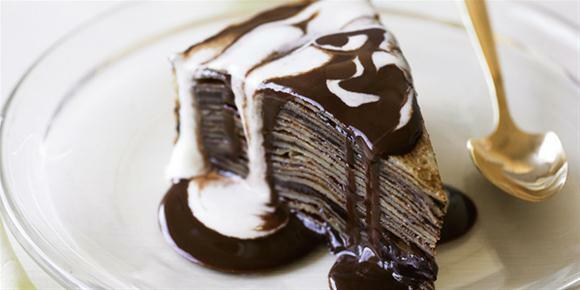 We love this no-fail recipe from chocolate cookbook 50 Shades of Chocolate. 1. Melt butter and chocolate over low heat and allow to cool. Add sugar, milk, eggs and vanilla essence and stir. Slowly add flour and stir until smooth. 2. Pour mixture equally into ramekins and sprinkle with chopped milk chocolate callets. 3. Bring water up to boil, take off heat and add sugar cocoa powder and vanilla essence until all have dissolved. Gently pour chocolate sauce over the back of a spoon on top of the mixture into the ramekins. 4. Bake for 20-25 minutes in 180C oven. 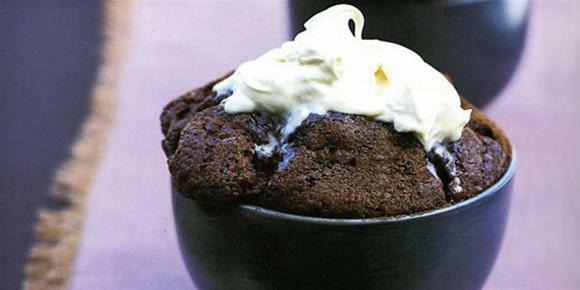 Serve hot pudding with deliciously cold ice cream. 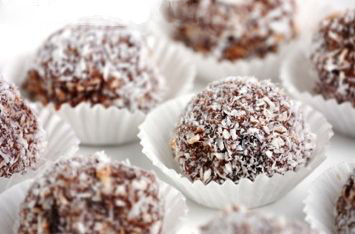 Recipe from www.50ShadesOfChocolate.com.au by Claire Preen, RRP $14.95. Can you believe you can make the fluffiest, most decadent chocolate mousse with only 2 ingredients – chocolate and water? And it’s ready in 5 minutes! Because this 2-ingredient chocolate mousse recipe uses only chocolate and water, use the best quality 70% chocolate you can find. If you find 70% chocolate too bitter, feel free to add a little sugar. 1. Place a large mixing bowl on top of slightly smaller mixing bowl, filled with ice and cold water (the bottom of the large bowl should touch the ice). 2. Put the chocolate and water in a medium-sized pan and melt the chocolate over medium heat, stirring occasionally. 3. Pour the melted chocolate into the large mixing bowl sitting on top of ice and water, and start whisking with a wire whisk (or an electrical hand mixer) until thick. This will take 3-5 minutes. Note: Watch the texture as you whip and be careful not to over-whip as this will make the mousse grainy. Only whip until it begins to thicken and hold soft peaks (like whipped cream). If the mousse becomes grainy (which is possible on your first try), transfer it back into the pan, reheat until half of it is melted, pour it back to the mixing bowl and whisk again briefly. 4. Chill for 1 hour or enjoy as is. Tip: This is a rich, dark chocolate mousse. Add a dollop of freshly-whipped cream to lighten the richness. Top with seasonal berries. Or serve over poached pears in individual bowls. 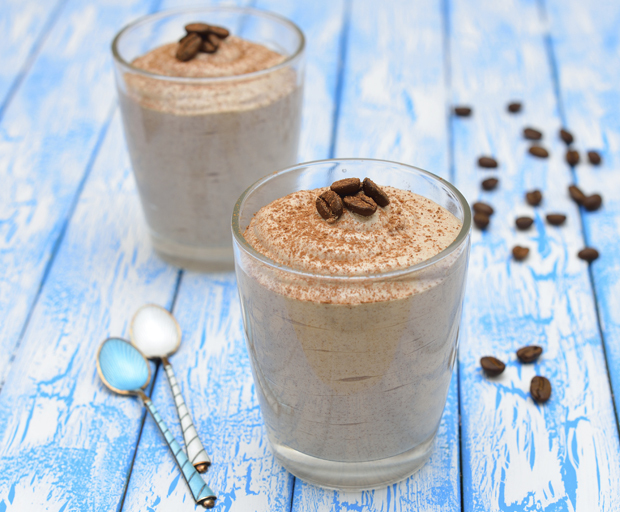 What’s your favourite chocolate mousse recipe? From the saucy new cookbook 50 Shades of Chocolate comes this recipe for addictive chocolate coconut macaroons from award-winning chocolatier Claire Preen. You won’t be able to stop eating them! 1. Melt the chocolate over a double-boiler. 2. Whisk the egg whites with the salt until they form soft peaks. Add 3-4 tbsp of sugar and whisk until mixture is glossy yet firm. Fold in the remaining sugar and then fold in the chocolate, coconut and vanilla. 3. Place small spoonfuls of the mixture on a baking sheet and bake at 160C for about 15 minutes. 4. Melt the white chocolate in a double boiler and half-dip the cooled cookies into the white chocolate. Clair Preen’s chocolate cookbook 50 Shades of Chocolates contains over 60 delicious chocolate recipes that can be enjoyed by yourself, with your partner or at a dinner party. Available from newsagents for $14.95. Visit www.50shadesofchocolate.com.au. 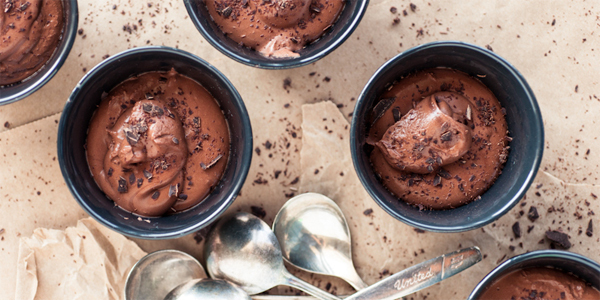 Everyone loves chocolate panna cotta but it can be intimidating to make – will it set? Will it be too soft, or too hard? Here’s a foolproof method using a vegetarian gelatin so everyone can enjoy this amazing dessert! 1. Dissolve one sachet Queen Jel-it-in in the milk and then pour into a saucepan. 2. Add the cream and caster sugar and heat, stirring, until the sugar has dissolved and the mixture starts to bubble. 3. Divide it between panna cotta moulds and leave to come to room temperature then chill for at least 3 hours. 4. Invert onto a plate to serve. Serve with berries and cream (optional). Which recipe would you like to see get a quick and easy makeover? 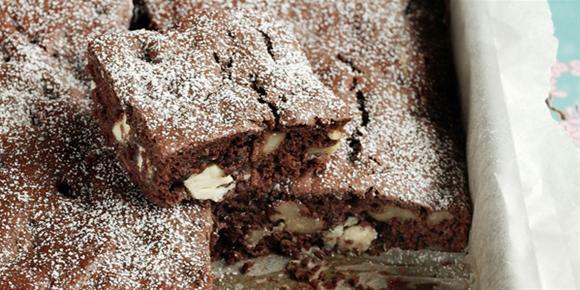 Who doesn’t love gooey, fudgey brownies with a crispy top? These decadent brownies are studded with chunks of white chocolate and crunchy walnuts – bake a batch this weekend and watch them disappear! 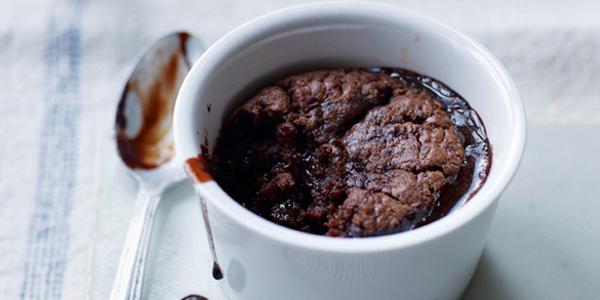 This is the easiest chocolate self-saucing pudding recipe we’ve tried – and the best. Serve piping hot with a scoop of vanilla bean ice cream on top. 1. Preheat oven to 180C. Beat butter, sugar, egg and vanilla in a bowl. 2. In another bowl, sift flour, baking powder and cocoa powder together. Fold into the butter mixture. 3. Spoon into a medium-size greased baking dish. Mixture together the sauce ingredients and sprinkle over the batter. 4. Carefully pour the boiling water over the batter. Bake for 30-35 minutes.